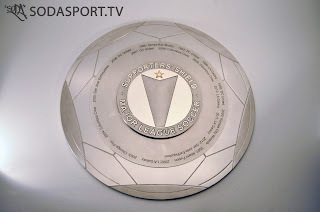 Today the Independent Supporters' Council and the Supporters' Shield Foundation made an announcement concerning the Supporters' Shield. It was announced that through a combined effort of many of the leagues supporters groups, a new Supporters' Shield has been created. While I loved the old shield and it's grassroots build up to it, I completely understand the reason and need for a change. The original shield had been made on a small budget and had basically run out of room for new teams to be added to it. And I absolutely love the new look of the shield. It has a clean, professional, look to it. I've heard Sam Pierron tell me the story before, but it's an amazing story of how the original shield came to be, through the work entirely of the supporters of the teams and individuals around the league. Check out the story, as well as the rest of the new site set up for the Supporters' Shield.